Shiraz by Peter Lehmann of Barossa Valley. A seamless wine with excellent structure, the palate has a good depth of dark berry flavours and a touch of savouryness, in harmonious balance, all reined in by soft but firm, fine grained tannins. The Peter Lehmann team can be proud of a long and illustrious history with Barossa Shiraz. Barossa Valley escaped the scourge of the devastating phylloxera epidemic, consequently many of it's vineyards remain planted on their original rootstock, direct descendants of cuttings brought to Australia by settlers in the early 1800s from Hermitage in the Rhone Valley. The perfect steak wine, a fine accompaniment to roasts. The care and consideration which Peter Lehmann Wines brings to the selection of grapes enable the winery to produce its wide range of distinctive, award-winning and internationally acclaimed wines. 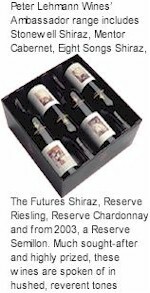 Peter Lehmann Wines are created from grapes purchased from about 185 carefully selected independent growers as well as grapes grown in the four company-owned vineyards. Many of the growers families have worked the same vineyards for five and, in some cases, six generations. These Barossa vignerons tend to around 900 individual vineyards that run the gamut of the Barossa, through Lyndoch, Vine Vale, Light Pass, Greenock, Ebenezer and the Eden Valley. It is significant that the majority of the vineyards from which Peter Lehmann source their fruit are classified as mature, ranging in ages from 20 to over 100 years old. Many are ungrafted and dry grown. The famous Barossa wine region is a little over an hour by car north of Adelaide, South Australia's capital. The Barossa comprises two regions, the Barossa Valley and Eden Valley. The Barossa Valley is generally less than 400 metres above sea-level and stretches from Williamstown in the south to Kapunda and Truro in the north. The red-brown soils are more fertile than those of the Eden Valley but rainfall here can be up to 50% less. Temperatures are generally about 2C warmer. Eden Valley includes the country from Truro in the north through to Mount Pleasant in the south. It ranges between 400 metres and 600 metres above sea-level with most of the winegrowing country located in the higher, cooler, wetter sections of the region. Soils are rocky and acidic and winter rainfall is plentiful, averaging 255mm more per annum than the Barossa Valley. Temperatures are cooler therefore the growing season is longer. There are about 550 growers in the Barossa, some of them sixth-generation Barossans. Together, they produce an average of 55,000 tonnes of grapes each vintage, harvested from over 8,000 hectares of vines. Internationally, the Barossa is unique in that it has never suffered an outbreak of phylloxera. This means that many vineyards still thrive on their own root stocks, distinguishing the Barosssa as a wine-growing region with some of the world's oldest vines. The history of the Barossa and its disproportionate presence in the super-premium categories make it Australia's most influential and internationally recognised wine region. Excellence in winemaking is about exploration and adventure. Peter Lehmann Wines is currently working with varieties recently introduced to the Barossa, including Tempranillo and Zinfandel varieties. The four company-owned Peter Lehmann vineyards, which produce just 2% of requirements, are comprised of the Stonewell, Riverflat, Andriske and Trillians Hill vineyards. The Stonewell vineyard, of 18 hectares (45 acres), is situated in the Barossa and produces Shiraz, Cabernet Sauvignon, Malbec, Merlot and Grenache grapes. The 1 hectare (2.5 acres) Riverflat vineyard, located near the winery, grows Semillon and features a sprinkler system installed to promote the botrytis infection required for the production of Noble Semillon. Similarly, the Andriske vineyard located near the winery is planted to 2.5 hectares (6 acres), predominantly with Pinot Noir, Shiraz and Riesling. The Trillians Hill vineyard in South Australia's Clare Valley is planted to 20 hectares (48 acres). It produced its first Cabernet Sauvignon and Shiraz crops in 1999.